Today October is all but over, the tenth month is about to pass by. How have your goals being doing this year? Ten months ago it was New Year’s Day or as I like to call it – “Amateur goal setting day” the day that many people set New Year’s Resolutions and very soon forget them. 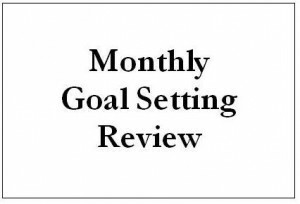 At the start and at the end of each month I encourage my thousands of readers to set and review their goals. In order to reach any medium to large goal, a regular review period is very important or the events of life can soon overshadow a goals position in the mind. To reach a goal it must be dominant in a person’s thoughts or it will become ultimately lost as events over take it; just like a New Year’s Resolution simply slips from the mind. So today review where you are in your goals progress, what have you learnt? What do you need to do better? If no real progress has been made this month, do not fret over it – just continue working towards it. And if you have reached your goal for this month, enjoy your result.